I love keeping a journal. I know the power that exists when I put pen to paper and write out my thoughts, feelings, dreams, and intentions. Some people though find the idea of writing intimidating. Thinking of what to write about causes many to not write anything at all. But journaling really does not have to be hard or intimidating. Instead, it can be liberating, gratifying and a powerful resource for achieving your dreams and practicing self-care. 5 minutes of free time. That's it! That's all you need to start. Free form. This is writing whatever is on your mind. You simply write the thoughts and feelings you are having at the moment down. Your writing does not have to be perfect in the sense of grammar, or spelling of words. The idea is to take whatever is in your mind and put it on paper. List 10 Reasons Why My Dreams Are Important. The benefits of journal writing are numerous and have been proven to have a positive effect on a person's mind, body and spirit. It is a positive way to practice self-care. Some of the benefits of journaling include stress reduction, improvement in mood and clarity of ideas. 1. Writing your goals down helps you to articulate them clearly. It makes your goals real and attainable. 2. You will have a record of your progress. Keeping a journal allows you to look back and see what you have achieved. In those times where you are having any doubts about your ability to succeed, you have something written in black and white that shows otherwise. 3. Writing requires you to think on a deeper level. It can provide an understanding of the whys and hows of the dream you are pursuing. It also helps to cultivate clarity about your dreams and purpose. 4. Keeping your dreams and progress on paper allows you to be more intentional about your decisions and actions. 5. Journaling helps you to see the next steps. You are able to see the steps you have taken and the next ones you need to take become clearer as you write. It helps to keep you from feeling stuck and unclear about your dreams and what to do to achieve them. 6. Writing about the path you are on provides opportunities to share with others your experiences. 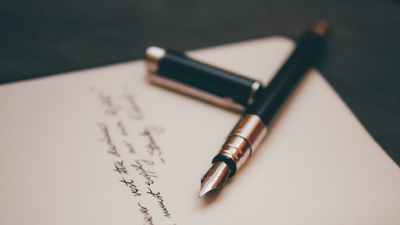 While journaling is a private matter, there may be times that you feel are appropriate to share your writings with others as a way of inspiring and encouraging them on their paths. Grab a journal, pen and 5 minutes of free time and start writing. Sign up for the Pen*Paper*Write Journaling Series. Receive monthly theme-based journal prompts, quotes, affirmations and creative journaling exercises to help you connect deeper with yourself and your God-inspired dreams. Purchase my e-workbook, Journaling To Your Purpose: Discovering + Planning To Live Your Purpose. This workbook includes writing exercises, tips, quotes, scriptures and other great ideas and information to discover and live your life on purpose. Sharing is a good thing! If you liked this article, please share it with three people you know. Subscribe to the wordsbytara.com Weekly filled with ideas, information, and inspiration for living your God-inspired dreams.